The reaction to a few migrant boats landing in the UK over Christmas puts us to shame. When a relatively small number of refugees crossed a becalmed Channel and landed on Kent’s beaches over Christmas, the government and the right wing media took its cue to ramp up an ‘immigration crisis’. Sajid Javid cut short his luxury safari holiday in South Africa and flew back to ‘take charge’. Defence secretary Gavin Williamson ordered British ships back to Blighty to patrol the channel. A month on it is clear that this was an over-reaction, designed to ensure Tory politicians looked ‘tough’ on people who had risked everything, travelled thousands of miles and been exploited by people traffickers trying to seek a better life for themselves. The Guardian recently covered of the case of of Hussam Allahham, a highly skilled Syrian surgeon who is not allowed to use his skills despite trying to regain his standing as a surgeon. Expensive language tests and requalification exams have prevented him from doing his job. Figures show that 70% of all refugees coming to the UK are still unemployed and 20% have had to change their careers to take any job available. Theresa May’s pledge to resettle 20,000 Syrian refugees – supposed to be the largest single response to a humanitarian crisis by a British government – has not been met. The reality is that a large section of this refugee population is denied the ability to work to their full potential. It is worth contrasting this with what has happened in Germany following Merkel’s ‘open door’ policy, and how they have handled the million plus refugees arriving in Germany after fleeing war zones. 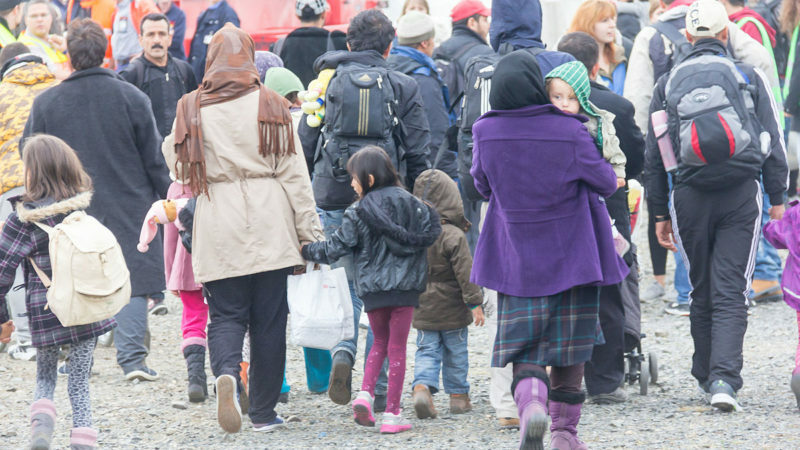 In 2015, Chancellor Merkel opened the German borders to war refugees. She faced down the hostility from the far-right Alternative For Germany (AfD) party who said the new arrivals would be a major burden on Germany’s welfare system, their economy and on jobs. But employment figures from Germany show that companies there have seen an incredible surge in people joining apprenticeships and to ‘on-the-job training schemes’ due a growth in applications for jobs from asylum seekers notably those from Afghanistan, Iraq and Syria. The Head of Germany’s Labour Office, Detlef Scheele, stated there was ‘no reason’ to be overly pessimistic about the country’s ability to cope with the record number of arrivals. “This is all going pretty well,” adding that the numbers were slightly better than expected. “These are good numbers, also taking into account that the people came here for humanitarian reasons and not for finding a job,” he said. “We are on a good path,” said Herbert Brücker, a professor of economy at Humboldt University. The number of employed refugees and migrants from the eight countries with the biggest numbers of asylum seekers surged by more than 100,000 to 306,574 in May 2018, compared with the same month in 2017, data from the German Labour Office showed. There were 500,000 people from the eight main asylum seeker countries who were registered as ‘looking for work’ in July 2018. Those figures however include the huge numbers of people currently completing state supported integration and language courses. One of the reasons for the high take up are the current skill shortages in Germany. Germany’s crafts and trades have long complained about skills and labour shortages, as young German’s are no longer willing to commit to the German model of apprenticeships lasting up to four years. These industries have become active recruiters of refugees from war zones. The speed with which refugees had started work had surprised him. ZDH, the German confederation of skilled crafts, announced that the number of refugees doing a craft apprenticeships had risen more than 140 per cent year-on-year. Compare all that to the UK’s ‘seige mentality’ the UK public was subjected to over the Christmas holiday. Come Brexit day I suspect it will get worse. Tony Burke is Assistant General Secretary of the Unite union and is a Contributing Editor to Left Foot Forward.